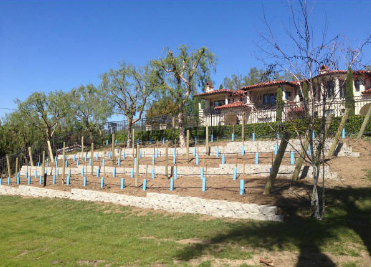 I reside in North Tustin, and on my drive down the hill from my home, I pass a small, picturesque vineyard planted in the front yard of a hillside residence. Seeing it almost daily is torture for me as I am insanely jealous. I approached my spouse about removing our pool and sport court to plant a vineyard of our own, but the suggestion was met with an icy stare. To preserve marital harmony, I have dismissed the dream (for now). The Cucamonga Valley-based company, My Home Vineyard (myhomevineyard.com), is responsible for this neighborhood vineyard. In 2013, it celebrated five years in the custom vineyard business, having planted, or assisted in the planting, of more than 60 in Southern California, mostly of wine grapes. Last year alone, vineyards were installed in Fullerton, Anaheim Hills, and North Tustin (including The Meyer Vineyard in my locale). The company also provides established vineyard rehabilitation and maintenance, and troubleshoots problems with pests, diseases, and varmints. Some have referred to home vineyards as “vanity vineyards,” but there are several real advantages to them. They’re an attractive landscaping feature that can add to a home’s ambiance, and they’re a good low-water, low-maintenance alternative. Vines also thrive on slopes, which are notoriously difficult to landscape and maintain. You can make your own wine from your own estate grapes, or pay for the vineyard by selling grapes to other home winemakers. Or, if you choose to plant seedless table grapes instead of wine grapes, you can supply your family and neighbors with fruit fresh off the vine. Because of the warm climate in Orange County, the most suitable wine grapes include cabernet sauvignon, cabernet franc, merlot, syrah, and grenache. Vineyard costs include a $100 initial on-site consultation fee and estimate, plus materials and labor. You also can plant the vineyard yourself. My Home Vineyard will draw up a full plan, including basic instructions and a schedule of supplies and equipment needs. Mark Ryan, a professional videographer who has won two James Beard Awards for wine films produced through Orange County’s own Grape Radio, has filmed some of My Home Vineyard’s activities and home vineyards. His website is at Flow-Films.com. You might also visit the informative My Home Vineyard website at myhomevineyard.com to view photos and videos of custom vineyard installations, as well as vineyard owner references and contact information.